Since that time I’ve rested from D&DXP, written some fun DDI (Ecology of the Vegepygmy was announced as coming out in April!) and continued working with the Ashes of Athas admin and author teams on fantastic adventures for Chapters 5 and 6! I’ve also been devouring as much old content as I can, as if the past could hold the keys to the future. It just might. I’m also enjoying the discussion instigated by the D&D Next group and the Legend & Lore series (now back in Mike Mearls’ hands). The first thing I always take from these is that D&D is in good hands. It would be easy to take 4E and want to go to solely forward to 5E, and to do so from the position of designers that “know” what to do. Instead, I see these talented designers turning to us for feedback on very key issues. The ideas are criticized, for sure, but we should realize that they must present an idea that is volatile enough so we react and provide feedback. Do the designers realize these are important issues and that the feedback needs to be considered? It sure seems so! A clear case of that is when we see a part II to any post. Saving throws and the issues of dying (and challenge level) have earned that distinction. These are clearly tough topics, because they link to many aspects of the game. What is a hit point total without knowledge of expected monster damage? What is a save or die power without an understanding of expected frequency and even of overall lethality? What are leaders like and what kind of healing can any PC do? These issues are all related and will impact play… just as it has in every edition. Lets look at this, in part influenced by what DeadOrcs writes here and Steve Winter writes here. Basic’s look-up tables for determining a hit. Let’s be clear. The only reason we are spending time discussing hit points, damage, and save or die is this: it is too hard for PCs to be threatened in 4E. What causes this? Why is this such an impediment for most, but not for all? Is the solution a return to AD&D or some other edition? Our view of 4E lethality is sadly tarnished by the edition’s initial damage math for both PCs and monsters. A typical straight PHB party (with a few exceptions) against MM elite brutes was a low damage and high hit point snooze-fest. You knew the PCs would win…just not how many hours it would take! (On the positive side, this really encouraged DMs to innovate their encounter design so fights would be exciting). Over time we saw PC damage escalate substantially. Fullblade-style shenanigans and off-turn combos could see buckets of damage thrown at monsters. Nova, one-shot, we heard those terms a lot… for a while. A party of level 1 Essentials PCs can deal more than 130 points of damage if they have surprise and initiative! In contrast, monster damage saw few improvements at first. When I wrote organized play’s first LFR paragon adventure I spent hours finding monsters that could properly damage PCs at that tier. MMIII and beyond brought monsters that were a lot better – higher damage, lower defenses and hit points. Where tables of Living Forgotten Realms once asked DMs to please give them the high challenge option and add some extra difficulty on top, that same choice today in heroic is usually a TPK. I can’t think of a low-mid heroic tier LFR adventure in the last year that wasn’t an exciting combat that could have ended badly for us. Dark Sun monsters deal significant pain at all levels. And in Ashes of Athas we really can’t go harder than level+2 encounters, especially since PCs have very few magic items. Finally, there is a disparity across tiers of play. As discussed by DMG 42, the damage dealt by monsters as a fraction of PC hit points actually declines as the level of play increases! In a soon-to-be-published blog by GoingLast, they research how PC damage also scales poorly. In comparison, OD&D’s first three books saw every PC have 1d6 hit points (fighting-men get +1 at 1st level, but strangely lose it at 2nd level). It was easy for the wizard to end up with more hit points! All damage was 1d6, including from monsters, so you can see where this would take us… if something hit you, you could go down. Get hit twice, and you had to be really lucky to be alive. And, at 0 hit points you were dead. Dead! Battles were basically about the luck of hitting (and everything usually missed) and whether your DM was kind (a random encounter could feature 100 nixies, all dealing 1d6 and having 10 charm spells… and charm ended only when dispelled… oh, and the nixies come with 10-100 fish that deal… wait for it… 1d6 damage). Players also did tricky things to avoid damage: 10′ poles, sending mules and henchmen (or both) at trolls, throwing oil, etc. OD&D’s Supplement I, Greyhawk, added the rule of hit die type varying by class (d4 for magic-users, etc.) and fixed some spells like Charm. Gaining levels gained you more attacks and better spells, but as we discussed before it was a brutal game. The previous owner didn’t follow the instructions for the special d10 (no true d20!) that comes with some versions of the Holmes set! 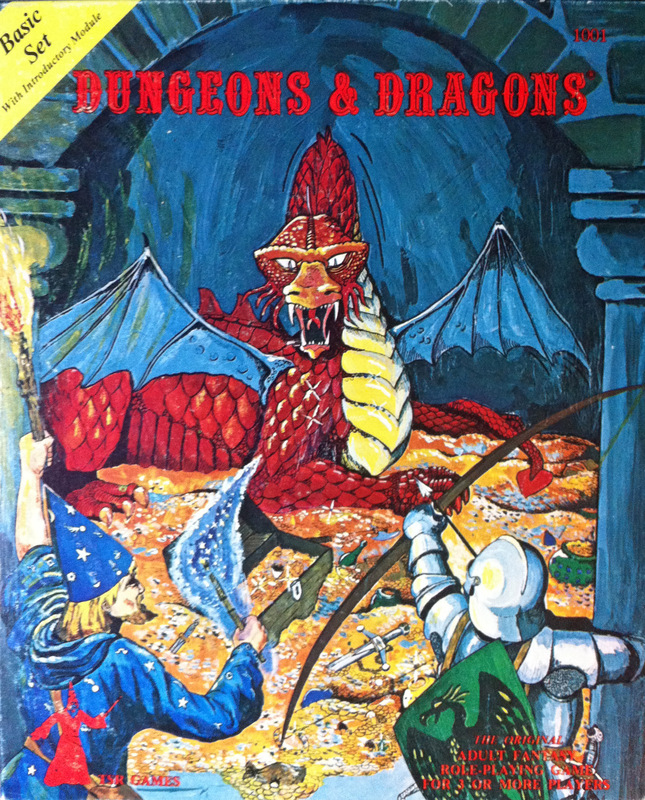 Our group took up the first Basic D&D set, released in 1977 (three years after OD&D and two years after the Greyhawk and Blackmoor supplements). 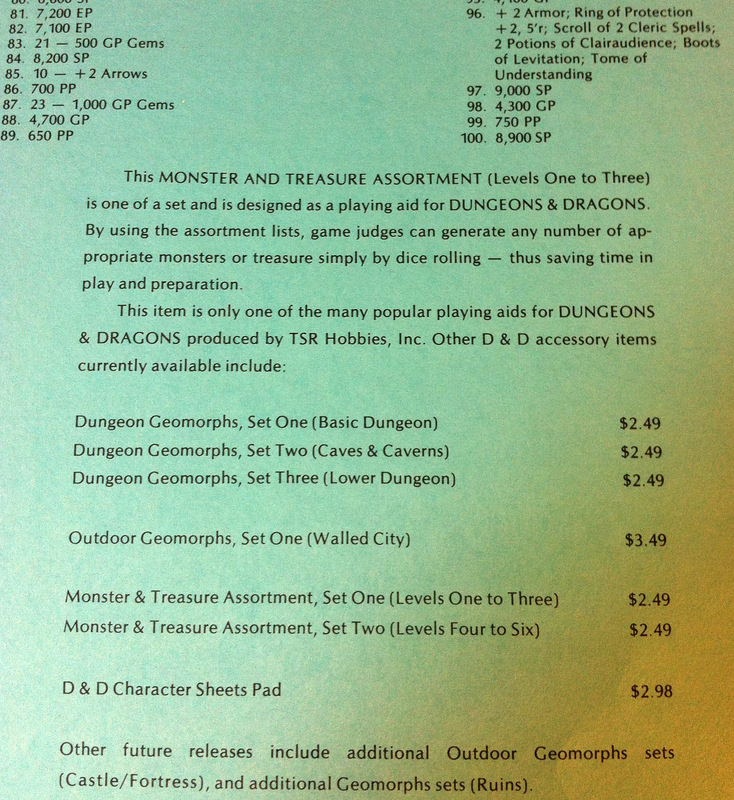 While AD&D is often seen as Gary’s edition and Basic as Dave Arneson’s, it was written by a freelancer: Eric Holmes. It pulled together the OD&D box, supplements, and its various fixes. You can purchase the 1981 version, by Tom Moldvay, here. Our group’s first reaction was one of confusion. We really were not prepared for a book that was more poorly worded than OD&D, but this actually may be. It is actually hard to tell whether elf and dwarf are a race or a distinct class, and the class features are never in one place. At the end of character generation we were pretty sure we had a few things wrong. Thankfully, the game is very simple. 9 pages contain the information for players. The rest is spells, monsters, items, and a smattering of info about running a campaign. The included adventure is B1: In Search of the Unknown. I had completely forgotten this, but it is one of a few adventures that teaches by dumping the work in your lap. 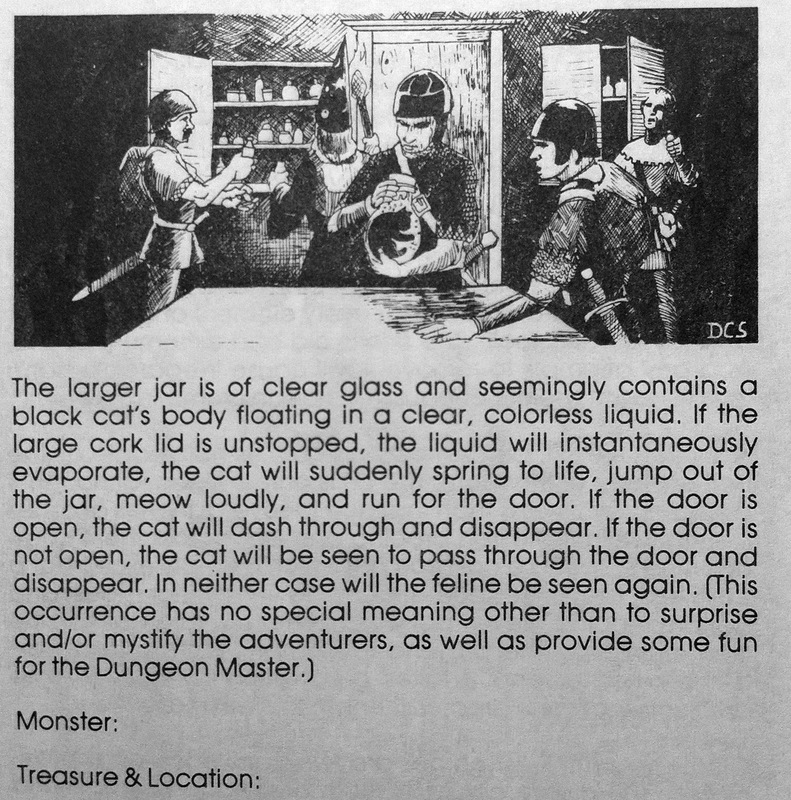 A barebones description is provided for a room and then the DM should go to the monster table and pick something. I’m sure the vision is of a DM doing a lot of work up front, but they probably picked at the last minute, as I did, which vastly increases the illogical stocked dungeon feel of old. Here is one of my favorite rooms, largely due to the wacky cat-bottle. Note the place they left for you to write in monsters and treasure! 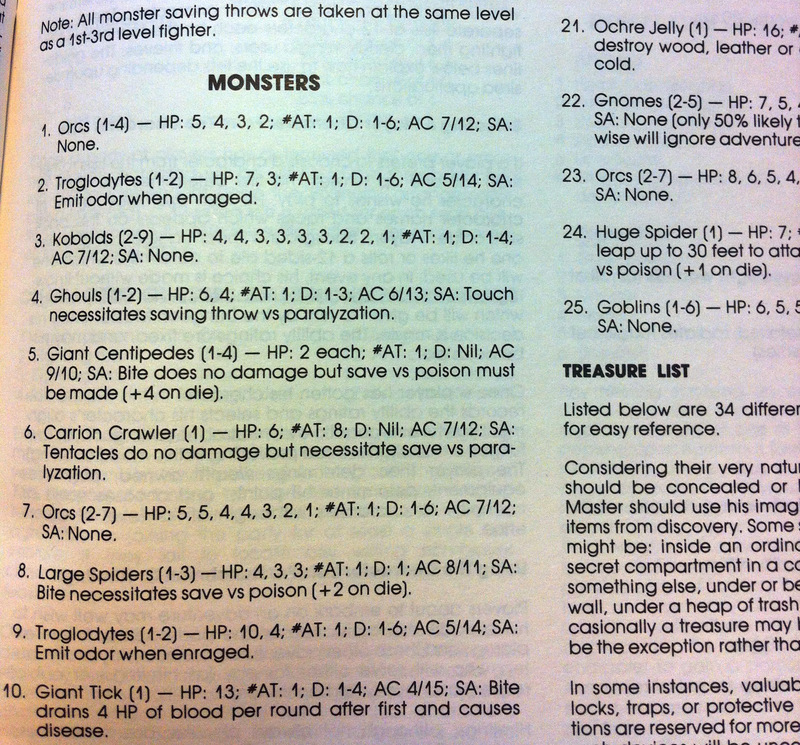 B1 monster table, which you use to populate the dungeon. 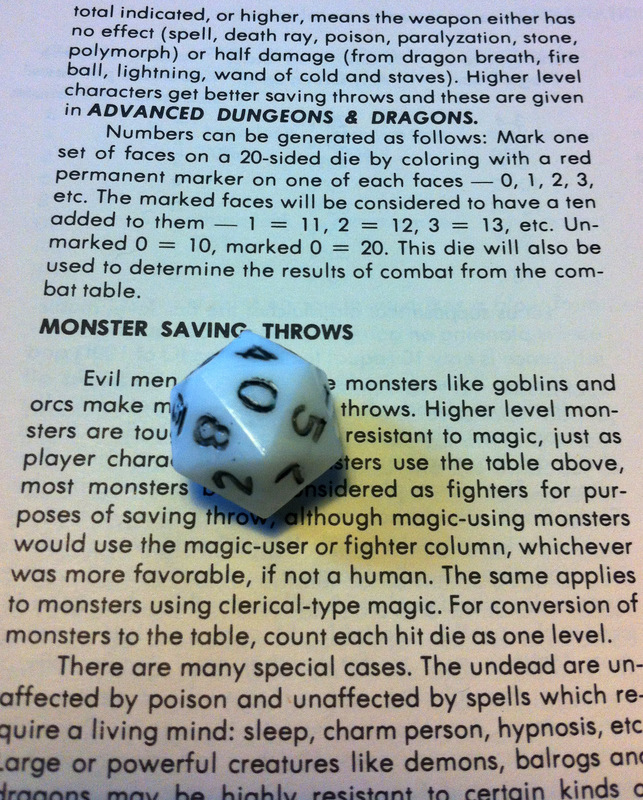 We can see that most monsters do d6 damage (though several have save or die or other effects). PCs in Basic still have very few hit points (high con can grant up to 3 extra hit points, and a fighter gets 1-8 at first level). How many hits do you want to take when your fighter has no more than 11 hit points, and probably an average of 5? 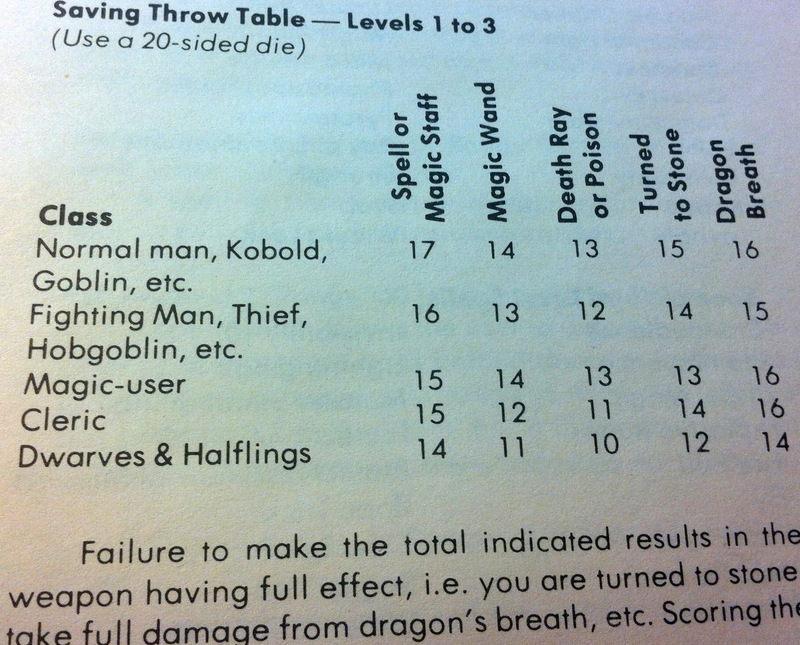 The core truth of unforgiving monster damage remains in each Basic version and even in AD&D (with slightly more PC power). It is really only in Skills & Powers for 2E and then in 3E were PCs begin to accrue the building blocks toward reliable survival. And yet, it was only a start. Most 3E players can talk about a time when a monster took their PC from full HPs to death. Other monsters could cause an irreversible death, such as by dissolving the PC. And there were save vs death situations. While I like the potential thrill of these situations, far too often the result is disappointing – especially if we care about our characters. Just read those categories and try not to laugh! 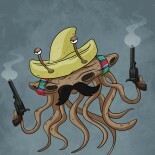 Death Ray, baby! Further hurting the old editions, healing was problematic. Healing was largely the cleric’s job, and the cleric had to spend actions and get rid of cool spells to keep the party standing. It felt like a chore, which is why the cleric was often a role that was accepted like this: “fine, I’ll be the cleric.” In 3E organized play, it was customary to carry signs stating your desired party level while shouting “need cleric” (as everyone else in the room was doing). 3E also had wands and such, which further created a post- and pre-combat dynamic that was largely unhealthy. 4E was designed as an antidote to all of these problems. Each of the solutions it brought forth was really good. A system (surges) by which PCs could heal out of combat and in combat (second wind) if there was no healer. A role, the leader, that could heal – meaning it wasn’t the sole domain of the cleric. Leaders could heal with minor actions, allowing them to do stuff, plus their attacks often dealt damage and provided either healing or protection or helped reduce further damage (perhaps by bolstering an ally’s next attack). Hit point totals escalated, as did damage, but on the whole the larger numbers provided insulation against a single lucky damage roll by a monster and allowed the narrative more time – it could now be the party’s narrative! Healing was higher too. Where before a typical cure spell often seemed to just give us enough for another round, 4E healing could often be significant – lasting us longer than a single round of combat. All of these innovations were excellent. They were just too much collectively. There are solutions (the simplest is to further increase monster damage while reducing their defenses). However, on the whole 4E has left far too many DMs feeling that they could not challenge their players and far too players feeling like the game was predetermined. Look no further than the reaction to Fourthcore for the proof. An antidote to the antidote, it caused people to sit up, blink, and suddenly recall earlier styles of play. That we see a ton of WotC designers approving of it is thus no surprise. When looking at D&D Next, it is tempting to follow this line of thought and discard all of 4E’s advances. But, as we see, the invulnerability came from previous problems. And there is more than mechanics to consider. Over the years, the baseline for how we play has changed. These days we expect far more story and connection from our play experience. Not everyone, and there are many styles of play, but on the whole we expect a greater narrative. Just as in the movies, we want the cinematic action to be surrounded by a compelling narrative… less The Beastmaster and Krull and more Lord of the Rings. Some of this comes from other RPGs. When we play Call of Cthulu with its investigation and horror, when we play Vampire, when we play Legend of the Five Rings, we come back with a desire for more story and RP. At the center of the action are our characters. Today’s author and today’s DM is supposed to work towards a fun adventure that interacts with the PCs, including their personal story. We see this even in D&D Encounters. Players that spend time on backstory are rewarded as the game feeds off of them. 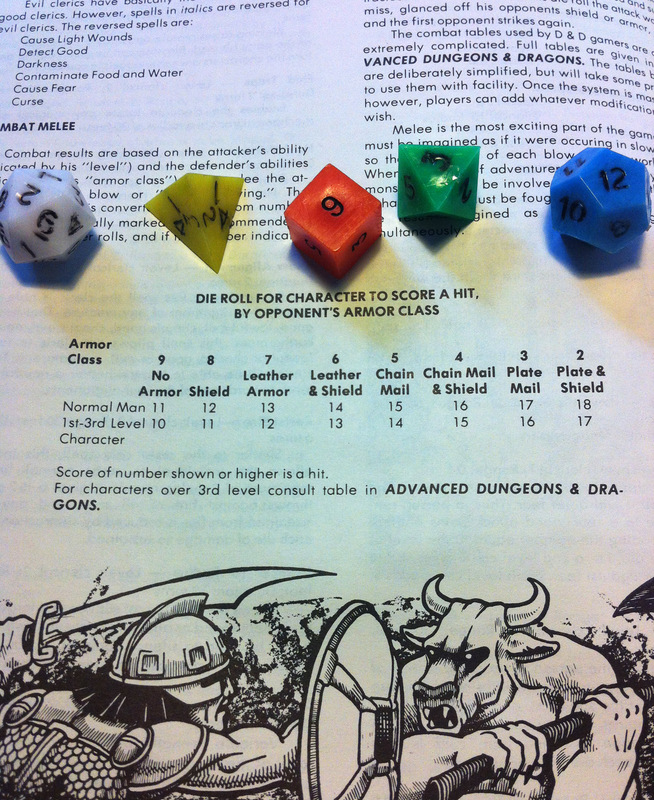 Compare how Basic is written to the DMG and DMG2 in 4E. The PC is barely a point of emphasis in adventure preparation, and certainly not in adventure design. The Basic adventure is a fun delve, with barely any story. The reason Ravenloft was so critically acclaimed is the same reason Gardmore Abbey is the most likely contender for best 4E adventure. As our PCs become important, they are less disposable. We want surprises but not gotchas. We want the thrill of victory, the agony of defeat, and the knife’s edge of a potential TPK… but we want it to feel fair. We want to go out in a blaze of glory for high stakes in a thrilling encounter, not a random spider bite in an empty meaningless corridor. For those reasons, we want D&D Next to feel like a fair system. Ideally it removes the excessive insulation that hurts 4E, while keeping some of the safeguards that make it such a fun and balanced system and can allow a DM to use combat as a narrative device. Similarly, our thinking about healing has also evolved. Do we want a return to wand healing, where we waste charges and gold and time to be able to keep adventuring? Do we again want to be at conventions or even our home groups, hunting for that player that actually likes playing a cleric… and then hope they actually are a healing cleric and not a battle cleric? Do we want the encounter to hinge on how much healing the cleric took, and whether they drop in combat? Do we want the cleric to spend time choosing cool utility spells, only to convert them to curing instead? Do we want the cleric to have to spend an entire round doing nothing but healing… when we may drop the very next round even when they do? We closed the lid on the Holmes Basic set with a sigh of relief. Unlike OD&D, which felt so different from recent editions, Holmes Basic felt too much like a clone of OD&D (because it largely was). The game had offered too little. While we continued to enjoy the exploration and narrative space that was possible, our PCs felt limited, thin, and vulnerable – because they were. And this hurt our enjoyment of the game. Sure, we could work to make all of this better. I could take B1 and work on it to make it story rich, just as the PCs could work on their end as well… but in truth we would prefer to do that over a better rules layer. 4E provided immense innovation. In the realm of survivability, it went too far. For too many it is a system where the PCs cheat death. On the other hand, our experience in Basic was that death was cheating the PCs out of a good experience. It was possible to have a PC die 3-4 times in a game session… and that wasn’t a fun story (though it pairs excellently with chips and drinks). As I ponder the fantastic potential of D&D Next, I have high hopes. I yearn for an edition where the average DM feels the game is dangerous for PCs, but the players feel there is more than a die roll or two deciding their fate – especially that their actions will influence the outcome. Importantly, I hope D&D Next continues to contribute to the idea of a PC being part of a narrative and the adventure and DM working to further that. It has become one of the game’s greatest strengths (and can always be removed for delve-style fun). While watching a game of the Holmes set was my first brush with D&D, I had never played it before 2012. Next time our gaming group will move into the edition I started with: the Moldvay Magenta set! My memories can’t be wrong. This must be the best edition of all, and practically perfect in every way!!!! This entry was posted on October 12, 2015 by Alphastream and tagged 5E, Basic, Challenge Level, RPG History.